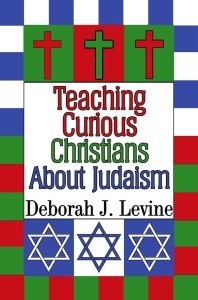 The award-winning, best-selling how-to manual by Deborah Levine, Teaching Curious Christians about Judaism, is a primer in lesson-plan format with pictures, Q&A sections, a glossary, and helpful Take Away Pages. Designed for both youth & adult education, the handbook is used by organizations that are religious and/or interfaith related. The original version won a National Catholic Press Association Award. The revised edition was taken to the Vatican as a gift for Pope Francis. “The lessons Deborah and I created for this book years ago are simple yet creative. They provide a taste of Jewish life. Even if no Jews live in our neighborhood, the responsibility to build a relationship of mutual respect remains vital today. “Thank you for the copy of your book and for bringing back pleasant memories of our work together at the Workshop on Christian-Jewish Relations. It has always been a valuable resource and I am a glad to hear that the book has been updated and made generally available in our neck of the woods.